OSHA Training offers a wide selection of training materials and resources to help broaden worker and employer knowledge on the recognition, avoidance, and prevention of safety and health hazards in their workplaces. OSHA 10hr or 30hr training is recommended by some States and companies in order to be qualified to work on construction sites or perform certain duties. OSHA recommends Outreach Training as an orientation to occupational safety and health for workers. 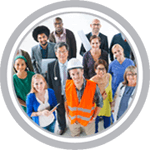 U.S. DOL Occupational Safety and Health Administration (OSHA) works to prevent injuries and protect the health of workers. US DOL Occupational Safety and Health Administration (OSHA), including the laws, regulations, and services. The Occupational Safety and Health Administration (OSHA) is a branch of the United States Department of Labor and has the responsibility to ensure day-to-day workplace safety for millions of Americans. As a regulatory agency of the federal government, OSHA creates rules that have the weight of law wherever they apply. For most workplaces, the rules that apply are in 29 CFR 1910. What is OSHA 29 CFR 1910? For reference and enforcement, the rules created by all federal regulatory agencies are collected into a multi-part document called the Code of Federal Regulations (CFR). Within the CFR, regulations are organized by the governing department and the topic of the rules. The rules from the Department of Labor, including OSHA’s regulations, are found in Title 29 (Labor) of the CFR. The most commonly-encountered OSHA rules are those that apply to “general industry,” or most workplaces in the United States, and these rules appear in Part 1910 of Title 29. This is where that mouthful of letters and numbers comes from: 29 CFR 1910 just means “Title 29 of the CFR, Part 1910.” This collection of regulations is often referred to as OSHA’s Occupational Safety and Health Standards. While Part 1910 is the broadest collection of OSHA regulations, OSHA also has different sets of rules that apply to certain industries. Shipyards are covered in Part 1915, for example; construction is in Part 1926, and agriculture is in Part 1928. What is Covered in 29 CFR 1910? I’ll be providing a look at the first three of these subparts. The scope and applicability of the safety and health standards of the Contract Work Hours and Safety Standards Act is found in this general section. Subpart A discusses variances, inspections, and rules or guidelines from the construction industry. Exploration of Right of Entry, by the Secretary of Labor—or their representative is included and other administrative adjudications for the enforcement of safety and health. The OSHA 1926 construction regulations and standards are published starting in Subpart C.
Subpart B of OSHA 1926 provides the general policy and interpretations of section 107 of the Contract Work Hours and Safety Standards Act. It also defines some of the key terms and responsibilities. “Laborers and mechanics” must be provided with working conditions and surroundings that are sanitary, not hazardous, and not dangerous. Establishing that there are no gaps in the requirements for providing a sanitary and safe workplace. All construction employers must provide their employees with a sanitary and safe workplace. This subpart also includes a minimum wage provision that requires those engaged in federal, or federally funded construction projects, be paid a minimum wage that is in accordance with the prevailing wages as determined by the Department of Labor. OSHA 1926 Subpart C also contains the definitions of key terms used throughout the 1926 construction standard. For example, the definitions for terms such as competent person, qualified, approved, and suitable can be found section 32. General health and safety requirements such as: first aid, fire protection, housekeeping, illumination, sanitation, and personal protective equipment are covered in sections 22 through 28. 1926.20 - General safety and health provisions. 1926.21 - Safety training and education. 1926.22 - Recording and reporting of injuries. 1926.23 - First aid and medical attention. 1926.24 - Fire protection and prevention. 1926.28 - Personal protective equipment. 1926.30 - Shipbuilding and ship repairing. 1926.33 - Access to employee exposure and medical records. 1926.34 - Means of egress. These Sample Written Programs are designed to help you create customized programs for your specific needs. Originally designed for OSHA employees, it is now available to the public for free. With regard to confined spaces in construction, OSHA Standard 1926.21 (b)(6)(i) states: “All employees required to enter into confined or enclosed spaces shall be instructed as to the nature of the hazards involved, the necessary precautions to be taken, and in the use of protective and emergency equipment required”. Quick Cards summarize safety information. They can be printed, laminated, and distributed to employees as a reminder of what they need to know and do in order to keep themselves safe. Note: A copy of Appendix D must be given to people who wear respirators even though they aren’t required to by the OSHA Standard. The Safety and Health Achievement Recognition Program (SHARP) is designed to provide incentives and support to employers to develop, implement and continuously improve effective safety and health programs at their worksite. SHARP provides recognition for employers who demonstrate exemplary achievements in workplace safety and health. These companies are exempted from a general scheduled Federal OSHA inspection for one to two years. How Can My Company Participate In SHARP? For more information, visit the OSHA web page for SHARP programs. Welcome to OSHA Training - a leading provider of construction and general industry safety training. Is your organization compliant with OSHA standards? We can help you comply for the safety and well-being of your employees. We offer the most convenient OSHA-accepted online OSHA training courses - like OSHA 10-hour and 30-hour in Construction or the General Industry to get you into a job.